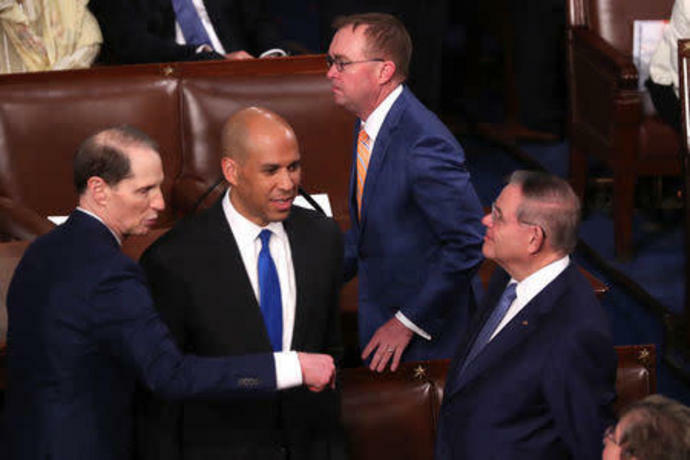 WASHINGTON (Reuters) - Democrats vying to challenge U.S. President Donald Trump in the 2020 election moved quickly to attack his State of the Union address on Tuesday night, saying it lacked substance and did nothing to unite the country. About 10 Democrats have already launched campaigns to challenge Trump, and a dozen more could enter the race for their party's nomination. U.S. Senator Cory Booker, who announced his own bid last Friday, said Trump's call for unity on Tuesday was hollow. "It takes more than a nod to unity at the top of a speech to bring our country together. Our president has spent the last 2 years trying to drive us apart," he wrote on Twitter. "Actions speak louder than words." Stacey Abrams, who fell just short in her bid last year to become the first African-American and first woman governor of Georgia, delivered the official Democratic response to Trump's speech. But many of the party's presidential hopefuls chimed in afterward with their own critiques. "He wasn't moving us forward and rising to the challenges of the day," Senator Amy Klobuchar said on MSNBC. She also hinted at a likely run for president, saying she would hold a rally in Minnesota on Sunday to announce her decision. Senator Kirsten Gillibrand, who has launched her own White House bid, solicited campaign donations after a video of her shaking her head at Trump drew attention on Twitter. "President Trump has had years to bring this country together, but instead he has chosen to divide the country across every single line he can imagine," Gillibrand said in a statement. Trump used his speech to highlight a strong economy, but drew criticism by vowing to build a wall on the border with Mexico despite Democratic opposition. Angered by criminal and congressional probes into his 2016 election campaign team, Trump also told Democrats that "ridiculous partisan investigations" could damage American prosperity. Alexandria Ocasio-Cortez, who is not running for president but has emerged as a leading liberal progressive voice within her party since she was elected to the House of Representatives in November, said Trump's speech lacked policy substance. "I think the president was unprepared. I don't think he did his homework. ... There was no plan," Ocasio-Cortez said on MSNBC. "Is this a campaign stop or a State of the Union?" Other Democratic hopefuls railing against Trump included Senator Kamala Harris and Pete Buttigieg, the mayor of South Bend, Indiana. Senator Sherrod Brown, who is weighing a presidential campaign, said Trump had not done enough for working people. "The reality is that for far too many people in this country, hard work isn't paying off like it should," Brown said. "President Trump doesn't understand that, and he's used the White House to enrich people like himself."